330,940 projects launched. 12 million backers. $2.79 billion raised. And that’s just on Kickstarter. To date. Crowdfunding has been around for centuries, with roots traced to the early publishing space. Its more modern manifestations began in the late 90’s, with bands and film producers turning to the crowd to see their projects realized. ArtistShare launched in 2003, providing early proof of concept for internet crowdfunding, but it wasn’t until the launch of indiegogo in 2008 and Kickstarter in 2009 that the model really started to take off. The concept is appealing, especially in a world where tough interest rates and fickle investors don’t exactly favor those without a sterling resume or cash to spare. Crowdfunding allows anyone with a vision and hustle to realize their dreams. By defining what you’d like to do, why you’re the person to do it, how you plan on getting it done, and what you’re able to offer to those supporting your efforts, you can attract thousands of small donations that help make it happen. But make no mistake: launching a crowdfunding campaign for your latest, greatest idea is hard work. In the early days of internet crowdfunding, it might have been a bit easier. Not everyone was using the tactic, and expectations for how a campaign would be set up and run were much lower. But today, there are over 4,000 projects currently live on Kickstarter alone. The competition is fierce, and people expect much more from your campaign if they’re going to be forking over the money. Your idea might be new, your experience might be light, but your brand needs to look ready to rumble right out of the gates. And Brooks would know. His 2013 Kickstarter campaign for audio reactive fashion wear brand DropShades started with a goal of $15,000, but raised more than $78,000 over 34 days — 520% over their target. So what design assets are necessary to launch a successful crowdfunding project? Before you even think about creating a Kickstarter account, you need to take the time to define your brand and create an accompanying logo. It can be tempting to put pedal to the metal once you decide you want to try to crowdfund your idea, but in reality, you’re not asking people to back your idea. You’re asking them to back your brand. And if you don’t have a strong idea of what that brand is, odds are your potential backers won’t either. Once you can clearly define who you are, what your unique value proposition is, why you’re better than the competition, and how you want to be perceived, it’s time to settle on an image that represents the promise you’re trying to make. The development of a strong logo will serve as a cornerstone for the creation of the rest of your campaign and the correlating design assets. You’re going to spend a lot of time crafting the text of your actual campaign page, but before you go there, take the time to put together a website for your brand. This can serve as a dry run for the creation of the campaign itself, and grant your brand additional legitimacy as some backers take the time to research you before agreeing to pledge. Some may see this as an unnecessary step. What happens if you don’t hit your goal and it all falls flat? After all, only 35% of projects are successful. Doesn’t that make building a website a gamble? In theory, the answer is yes, but that’s the wrong way to think about it. The reason only 35% of projects succeed is because they don’t think about things like this. You want to be ready to hit the ground running when your project ends, and having a website in place is part of that equation. Plus, if your project isn’t successful, and you’re serious about making your dreams a reality, having such assets in play can put you in a stronger position to find funding elsewhere. For a crowdfunding project to be successful, you’ve got to commit to the hustle. That means loudly, consistently promoting the project and asking people to participate. Though there are plenty of ways for you to do so, the most important in this day and age is through social media. To make those calls to action compelling, you’re going to want to pair them with solid graphics. The pages directly tied to your brand are going to need custom avatars and header images. Updates on progress and time left should be conveyed graphically whenever possible, especially considering that images are 40 times more likely to be shared on social platforms than text updates. You’ll want to prepare as much of this as possible ahead of time to minimize stress during the campaign itself. That means having graphics ready to go for specific time and monetary goal markers. For many people, the starting point of interaction with the brand you’re trying to create will be on the Kickstarter campaign page. This is your chance to stand out from the crowd. A quick perusal of projects that were unsuccessful reveals a common trend: visually dull campaign descriptions, either heavy on text or uninspired in terms of design. From your header image to the images inserted in the various sections of the campaign page, you’re going to want visually stimulating and brand-consistent graphic design. A great way to accomplish this goal is incorporating a stylish infographic into your campaign set up. Infographics are some of the most widely shared forms of media on the web. Why? Because they present information in an appealing and succinct manner. Instead of loading up your campaign with oodles of text, say the same thing with a visual representation of the information. It will help potential backers get to clicking that pledge button a lot faster. If you ask the most successful folks on sites like Kickstarter, they’ll tell you that having a strong video is crucial if you want to hit your funding goals. It’s your chance to tell your brand’s story in a way that requires minimal effort from the potential backer. They click play, they watch, they listen, and they decide. Kickstarter themselves point out that projects with a video are 66% more likely to be successfully funded. It’s important to have a personal touch in these videos. Backers are investing in you as much as they are the product you’re trying to fund, so appearing on camera and speaking about what’s inspired you to go down this road is necessary. But you’re also trying to convey that you’re someone to be trusted with the money. Investing in professional videography, animation, and editing gives you the professional edge you need to build credibility. Running a successful crowdfunding campaign is hard work. It takes a lot of time, planning, and effort to get off the ground, and even more to make sure you hit that all important goal. 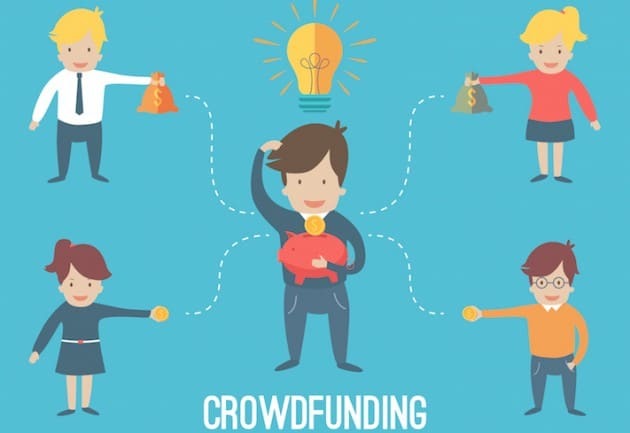 Though it’s tempting to focus on the product you’re trying to create, don’t forget for a second that crowdfunding platforms are not just a place to raise funds; they’re a marketing platform as well. By making sure you’re hitting the all the right notes with design, you increase your project’s chances of doing well.